A major international study that involved 312 babies from Aotearoa New Zealand has led to life-saving changes in the care of premature babies around the world. Findings from the Australian Placental Transfusion Study (APTS), taken together with data from similar trials, showed that simply waiting 60 seconds after birth to clamp a premature baby’s umbilical cord dramatically improves its chances of survival. This week, the University of Sydney-led study – which involved New Zealand researchers – won the prestigious Australian Clinical Trials Alliance Clinical Trial of the Year award presented by the Australian Minister of Health. 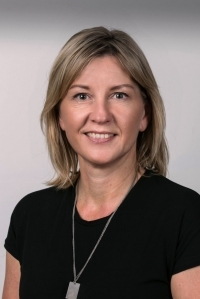 Associate Professor Katie Groom, the Hugo Charitable Trust clinical research fellow at the Liggins Institute, was involved in the study at National Women’s Health, Auckland City Hospital. “Before this research, we were unsure how best to care for these very small and vulnerable babies at the time of birth,” she says. Dr Groom is also an obstetrician and maternal fetal medicine subspecialist at Auckland City Hospital. A few years ago, she explains, it was standard practice to clamp the cord immediately after preterm birth and hand the baby to a paediatrician, in case the baby needed urgent help with breathing (by inflating the lungs with oxygen via a tube passed into the windpipe, or via a facemask). The research team behind the award-winning study, published last October, examined its results alongside 17 other randomised trials involving about 2800 babies born before 37 weeks' gestation, and found that delayed clamping cuts the relative risk of death in hospital by a third. Babies were also less likely to need blood transfusions, and there was no apparent increase in complications for mother or baby. Every year, around 5000 babies are born prematurely in New Zealand. The researchers estimate that worldwide, delayed clamping could save between 11,000 and 100,000 extra lives per year – and it costs nothing. It is thought that those extra, crucial seconds may allow premature babies to receive extra red and white blood and stem cells from the placenta, which may help them maintain healthy levels of oxygen, control infection better and repair injured tissue. It also gives them more time to start breathing by themselves, avoiding invasive procedures. “A perfect result for the research team – and for thousands of families around the world,” says Dr Groom. Waiting a minute before doctors clamped the umbilical cord connecting tiny Daisy Salter to her placenta was “the longest 60 seconds of our lives,” remembers Auckland mum Katie Salter. Daisy was one of more than 1600 babies from 25 hospitals in seven countries who were in the Australian Placental Transfusion Study (APTS). The participating New Zealand hospitals were Auckland City Hospital, Wellington Hospital, Christchurch Hospital, Waikato Hospital and Dunedin Hospital, with University of Auckland and University of Otago researchers in the international collaboration. The study contributed to new, powerful evidence that delaying clamping by a minute after birth for babies born before 37 weeks’ gestation lowers the relative risk of death in hospital by a third, and is safe for mothers and premature babies. When Katie went into labour at just over 23 weeks, Katie’s obstetrician, Dr Katie Groom, asked Katie and husband Neil in the delivery suite if they would like to join the study. Daisy arrived via an emergency c-section. “After she was taken out that was when the delayed cord clamping happened, and that was probably the longest 60 seconds of our lives,” says Katie. “I couldn’t see her because I was lying on the operating table and my husband was, I think, too scared to watch, so we just had to put our complete trust in the professionals, and we waited. In retrospect, I think it was a very, very big part in how well Daisy did. At 545g, Daisy weighed scarcely more than a pack of butter; small enough for Neil’s wedding band to fit around her arm. 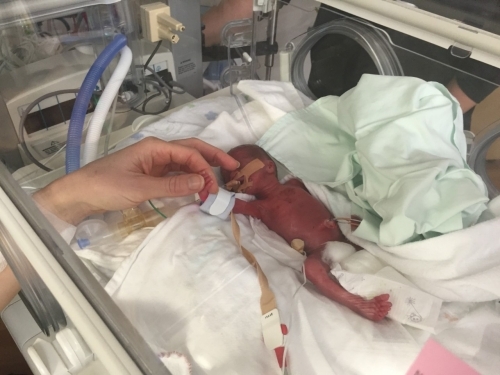 By the time Katie was stitched up and Daisy ventilated and stabilised, it was a couple of hours before mother and baby could touch, via a hole in the incubator. Daisy spent 102 days in the neonatal intensive care unit (NICU). Katie and Neil had to juggle time at the hospital with time at home with their other, preschool daughter, Ila, who could not enter NICU because under-fives are not allowed in during winter due to infection risk. At first, survival was touch and go, and as a very premature baby, Daisy faced high risks of serious ongoing health issues. “It was probably the toughest thing we’ve ever been through,” says Katie.